Eliot Logan Montgomery III and his wife Sheridan are living their dream life. He is US Ambassador to Venezuela and she is involved in helping abused and battered women start a new life. It is opening day of their new Women’s Shelter in Caracas. Eliot is getting ready to cut the red ribbon. Shots rang out. At exactly 12 minutes 35 seconds past 10 o’clock in the morning Venezuela time Sheridan’s world ceased to exist. Her best friend is killed and Eliot is seriously wounded. She is lying face down on the sidewalk, injured but not life threatening and something heavy is on top of her. She can'[t breathe and someone is screaming. The screams are coming from her. Finally the weight lifts and she is being pulled to her feet in the shelter of two strong arms. He is getting her away from the pandemonium. Her rescuer is none other than Luke Traynor whom she believes to be a spy for the US government. Luke is constantly protecting her through her long days at the hospital during Eliot’s slow healing. Sheridan dubs Luke Angel Gabriel (or Gabe) after the famous Archangel Gabriel in the Bible. One day, out of the blue, Sheridan’s Angel Gabe (Luke Traynor) arrives on their door step. How in the world did he find them and what does he want. They had not seen or heard from him since moving to Popala. No one is supposed to know where they are. This is where the novel becomes interesting. Sheridan’s sister Calissa has hired Luke to locate Sheridan and bring her back to Chicago. Her estranged father, Representative Harrison Cole, has suffered a severe heart attack, a stroke and is dying. Sheridan is reluctant to go with Luke. She doesn’t want to see her father and doesn’t care if he lives or dies. She cannot forgive him for his treatment of her. She is afraid to leave Eliot and her safe world. After much debate and probably such to spite Eliot (who does want her to go) she leaves with Luke for Chicago. Sheridan’s life undergoes another startling change when she and Calissa discovers Harrison’s ugly past. Evidence that implicates him in a conspiracy, diamond smuggling. And the fact her deceased mother had been a prostitute. Questions Sheridan can not answer – was Eliot involved in Harrison’s dirty dealings? Did he know she was Harrison’s daughter when they first met? Who is Luke and what role does he play is all this, Does she learn the truth about her marriage and confront her feelings for Luke? How does an elderly priest – Padre Miguel- help heal their wounds and restore their faith in God. One must read the book to learn answers to these questions. Ms. John is an excellent writer of general fiction. She puts the reader right in the midst of Elliot and Sheridan’s world – you feel their pain, fear and their lost dreams. I found the book refreshing, intriguing, sometimes sad, and sometimes uplifting. It is one you will stay up late reading so as not miss one minute in the daily lives of Eliot and Sheridan. Highly recommended. Ms. John is a marvelous Christian author. This is a 2-episode Christian live action & animated DVD about GiGi – an only child. In The White Lie, GiGi gets herself into trouble when she accidentally breaks her mother’s vase and lies about it. She tells one lie to her mother and another to her father. When they inform her she needs to go to the police and tell them she saw a kidnapping, a burgery and how the cat broke the vase, she owns up to the lie. She asks her parent’s forgiveness and also God’s forgiveness. In the Pink Surprise, when GiGi is told she is to be a big sister she is happy. However, she listens when one of her friends tells her that her parents will not love her as much, not have time for her and will spend all of their time with the baby. Thinking she will be second best, she decides to go live with her best friend. Her parents tell her there are other blessing in life than being first and there will only be more love in their home. Having a sibling is a blessing from God. This is an excellent Christian video. Recommended for children of all ages. It can be used to teach a Sunday school class or just lessons about honesty and loving your siblings, as well as loving God. Lying is a sin, your heart will become heavy with guilt, but God will always forgive you – you only have to ask. Parents, as well as God, always have enough love for you. The video can teach our children to love God, their siblings and to always tell the truth. This DVD was supplied by the publisher as a review copy. Support BookGateway.com by purchasing this DVD from Amazon.com. The author has written this book especially for Christian women. Grace – given to us freely by God the Father. Grace is received not earned. The author wants you to believe it – receive it – live it. She wants you to enter the “land of grace”. Have you ever walked in the “Garden of Grace”? Throughout the book. the author tells you about special people who not only received God’s amazing grace, but walked daily in the Garden of Grace finding the secure love of Jesus. In the Garden of Grace is where we grow spiritually. The author wants each woman to be a “SWOG” – A Super Woman of God. In your quiet time is where you walk in the Garden of Grace. In order to do this you must prepare yourself. How, you may ask, can I do this? The answer – PRAYER plan. What is the PRAYER plan? The more you learn from God, the more you will grow. The author tells us to put on our royal garments as we want in the Garden of Faith. These are your royal garments. When you are clothed in these beautiful garments – one you will wear above all others is the love of Jesus. The book is written for women, but I recommend it for all readers – believers and nonbelievers. For those who have already accepted Christ, you will grow more spiritually in the grace and knowledge of our Lord and Savior Jesus Christ. For unbelievers, who have doubts, take time to have a “quiet time” with Jesus, practicing the PRAYER plan and you too will become a believer as you walk in the Garden of Grace. Highly recommended. Ms. Martin not only “talks the talk but walks the walk”. Ms. Martin, along with her other accomplishments, is a well know author and founder of Quiet Time Ministries. 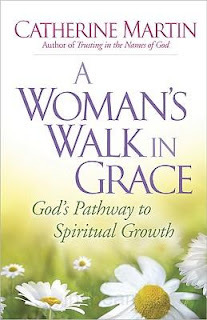 Recommend christian women read other books she has written to help you grow spiritually in the Lord. 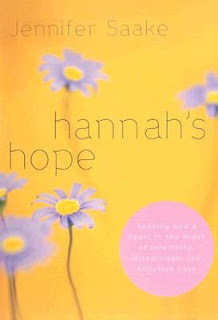 The book is written from the personal journal of the author as she experiences the heartbreak of infertility. 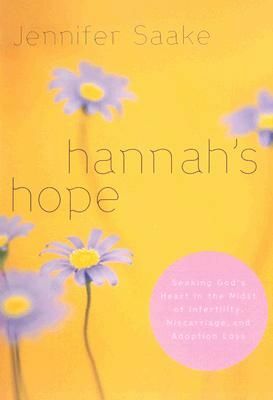 Hannah’s Hope is patterned after Hannah in the Bible. Hannah’s story can be found in 1 Samuel, Chapters 1 and 2 of the Old Testament. (I suggest you read her story along with Jennifer’s). Hannah too longed for a child to hold and nurture. She dearly loved her husband Elkanah, but was unable to give him a son. The Bible states she was barren. Jennifer loved her husband Rick. They had plans for a large family, but this didn’t seems to be in God’s plans. The story unfolds as the author takes you through the heartache and agony of losing her babies through miscarriages, still born, failed adoptions and in vitro fertilization (IVF). You will feel her pain as she experiences one failed adoption after another, year after year of not getting pregnant, and the agony of losing her babies when she does become pregnant. As you read her story, tears will flow, you will find yourself praying for her, becoming angry as you ask the question – how can this happen to one who so desperately wants to be a mother? Jennifer never loses her faith in God, however – she is determined to wait on His timing and His plans for her life. One must read the book to fully grasp the agony one goes through being unable to bear children. Does Jennifer and Rick ever have living children – the ending will surprise you. Through God everything is possible and He is with you no matter what you may have to endure. I found the book both soothing and heart rending as I made the journey with Jennifer and all the other women who are infertile. Highly recommend for all adult readers. You will come away with a thorough understanding of what it means to be infertile and how it impacts your life. CJ Baxter is a bestselling novelist from the small town of Adelia, NY, but now resides in Tennessee. 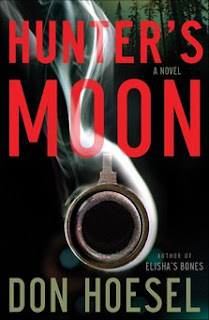 His novels are mostly about his own experience growing up in the Baxter family. Lyndale is the ancestral home where the Baxters have lived for centuries. CJ left home at seventeen and has not been back for almost three decades. CJ is returning to Adelia because his grandfather is dying – the only person he has kept in contact with over the years. CJ is having problems. His wife has kicked him out, changed the locks and kept his dog. Before he leaves Tennessee, he breaks into his former home and steals the dog. This results in the police issuing a warrant for his arrest. The Baxters have a secret – one that has haunted CJ since the age of ten. He knows the truth, but has been reluctant to face his father who has covered this up for years. CJ’s return is not a joyful reunion. His family is secretive, have their own agenda, and are skeptical of CJ’s motives. His brother Graham is running for the Senate. The last thing he wants is for the secret and his other underhanded deals to become known. CJ has been hired to write an article on Graham’s candidacy and the whole Baxter clan is concerned about what he will reveal. The longer CJ stays in Adelia, the worse things become. He finds himself having unhealthy thoughts concerning his high school sweetheart. The one he left decades ago and is now married to his cousin. One must read the book to learn how CJ handles this situation and all the other problems he faces. To what length will the Baxters go to get what they want. Blood may be thicker than water, but its no match for money and power. Highly recommend this book. It is one that you can’t put down – the suspense is addictive. Don Hoesel is an excellent writer of fictional suspense. Cade is a bounty hunter, the town of Winterborn, Kanasas’ most notorious citizen. He has a reputation of having the fastest draw, bringing a number of outlaws to justice. He left his own town fifteen years ago, leaving his sweetheart Zoe behind. He is only returning now due to the death of his sister and brother-in-law. His sister’s dying wish is for Cade to return and make the decision as to whom will raise her four young children. Zoe is very close to the children and can’t understand why Addy did not give her the children. Even though it goes against everything she holds dear, Zoe respects Addy’s wish and sends for Cade. According to Zoe, a bounty hunter is not a person to raise children or to make a decision as to what is best for them. After all, Cade has never been back since leaving and he won’t stay this time. She will fight him for the children as they are all she has – Zoe’s husband was killed in a bank robbery. How will Cade’s return affect her life and the children? She has loved Cade for so long, how will she cope with his return? Has he changed from the boy she knew or has he become hardened with the life he lives? Does Zoe get the children, or will Aunt Laticia get her way? What happens between Cade and Zoe? One must read the book to see how things play out. The book is one you can’t put down, keeping you in suspense to the last page. You will learn how the whole town helps Cade reach his decision. I highly recommend the book for all readers. You will be enthralled by Ms. Copeland’s ability to put you right in the middle of the situation. You will laugh, cry and rejoice with Zoe and her friends, even experience an old fashion middle of the street gun fight. Ms. Copeland is an excellent writer of romance fiction. 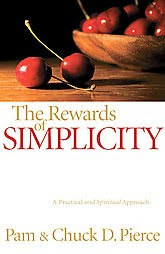 The book is about simplicity in your life – both physical and spiritual. Simply put – getting rid of the clutter. What is the book, though – personal confessions, a sermon, a bible study, a daily devotional, or two people’s unrelenting faith in Jesus Christ regardless of the circumstances and obeying His commands? It is all of the above. There are three keys to simplicity – faith, focus and function. While the authors clearly outline how to simplify your life using the three keys, quoting scripture pertaining to each key and detailing personal experiences, I was not overly impressed. The book reads like a personal journal of two people trying to (or who have already) simplify their own lives, obeying God and strengthening their own faith. As such it is just not that interesting or deep. On the face of it, we all know that we live cluttered lives, but I found nothing here that surprised or added to what I already knew I should be doing. The Pierces have served the Lord for many years, have written several books, and are well known. People will no doubt purchase this book because of who they are; however, it is one I would not. I cannot in good faith recommend the book. This is a very complex book! 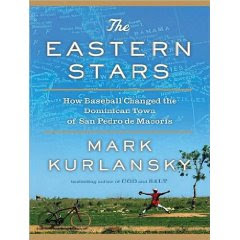 – Is it a history of the sugar mills and the town of San Pedro de Macoris … or a history of baseball and its players? Yes to both. San Pedro de Macoris is a small town in the Dominican Republic. For centuries their main industry has been sugar – exporting it to Europe and the United States. The great mills are no longer being operated, just abandon empty rusty buildings. The few left employ very few for four to six months per season. The town is extremely impoverished. Each ruling government party has bought in European and American developer to build large hotels to encourage tourism, but few tourist have come. San Pedro is one of the most ethnically diverse areas of the Dominican Republic and one of the poorest. The main mill is controlled by the existing ruling government party and at the start of the sugar season, a big banner goes up over the mill which reads “Gracias Presidente por ina nueva zafra” – Thank you President for a new cane harvest, as if he has anything to do with the good or bad harvest. The second industry in San Pedro de Macoris is baseball. “Baseball is not just a way of life – it’s the way of life.,” says the author. Make shift stadiums are everywhere – boys of all ages play baseball in dirt filled lots with sock balls and cane stick bats. Their dream is to make it in the United States big leagues – becoming rich and famous, returning to San Pedro to build big mansions and drive SUVs. The town is overrun with scouts from all leagues – sorting through all the promising candidates. Boys as young as 14 years are signed with a major US teams to be groomed to their full potential. Some never make it to even the A league, being released and sent home. But a select few have made it to the big leagues, keeping the dream alive for all the other boys. Seventy-nine boys from San Pedro have made it to the Majors – Jose Cano, Alfonso Soriano, and Sammy Sosa to name a few. Sammy is the only batter to hit 60 or more home runs for three consecutive years. He is one of only five players to hit 600 home runs. The book is a story of many who sought freedom from poverty through baseball. However,the total failures are almost the same as successes. When one asked the question – Why does the town of San Pedro produce so many baseball players? The answer – Because we don’t have anything else to do and we aren’t tall enough for basketball. Good book for baseball fans and historians. They will thank this small impoverished town for turning out such great players in a sport that has become America’s pastime. The Dominican Republic may be a challenged nation, but it sure turns out some great baseball players who have the dream of making it in the Big Leagues. This is the story of a young Palestinian girl named Amal borne in the refugee camp of Jenin. Her family had been evicted from their home during the 6-Day war between Palestine and the soon to be State of Israel. One must read the book to follow her journey from Jenin to a Jerusalem orphanage to Beirut, Lebanon to America and her decision to return to Jenin. Young Yasser Arafat had just formed the Palestine Liberation Organization (PLO) and the world would soon label him a terrorist. Tears will be streaming down your face as you experience her fear in being constantly under Israel’s guns/planes/tanks, the watchful eye of the Israeli solders, and the war crimes of Ariel Sharon. You will hear the voices behind the headlines of the massacres in Lebanon. Who are the terrorists – Israel or Palestine – the PLO or Israel’s Prime Minister. Will she survive her return to Jenin? The author was born to refugees of the 6-Day War and has first hand knowledge of what it is like to be a Palestinian under Israel’s thumb. The story will keep you turning pages to learn how she survives the death of her family, her marriage, the birth of her child and the hardships she endures in America trying to fulfill her father’s dream of getting an education. You will experience the family’s struggles to survive through over 60 years of the Palestinian-Israeli conflict. A must read book for all ages. When you have finished I believe you will come away with a different view of the Israeli government that is supposedly an ally of the United States. Roy Hallums is a retired U.S. Navy Commander working as a civilian in Iraq. His company, Saudi Arabia Trading, provides food for the American Army in Baghdad. With the collapse of Saddam Husein’s regime, kidnapping becomes the growth industry in Iraq for anyone with a car and friends with AK-47s. Anyone is a target: foreign correspondents, wealthy Iraqis, foreign diplomats. In 2004 Roy Hallums is kidnapped by such terrorists and this book is his story told with his own words. His family was not notified of his kidnapping for several months and only learn of the incident by seeing the video that aired on the Internet and Al Jazeera television. The family goes into denial – he is suppose to be in Saudia Arabia; not Baghdad. Since the US government does not negotiate with or pay ransom to terrorists, the government agencies, expecially the FBI, were not very helpful to the family, always citing national security. One must read the book to learn how Hallums survives the beatings, starvation, filth, moves from safe house to safe house, the threat of being killed, promises of being released, all the while forced to make videos surrounded by hooded men with AK-47s, and always having his face covered so he couldn’t see his kidnappers. For months Hallums is in total darkness, literally buried alive in a hole in the ground, covered over by concrete. And as Hallums see other captives come and go, some he is sure has been ransomed, others he is not sure if they were executed or freed, he is sure he will die any day, he thinks no one is really looking for him and he is doomed. He survives as he forces his mind to take mental trips, praying and asking God for his rescue. The book clearly depicts the cruelty of one human being to another. 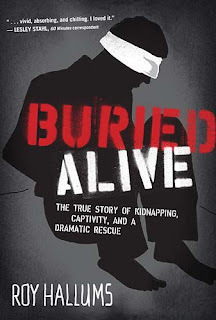 The book keeps you turning pages to learn how he survives day to day, and how he survives the drama of when or if he will he be rescued, ransomed by his company, or be executed. Recommended book for all readers, especially those interested in the Iraq war. As you read Hallums’ ordeal, you will become sad, find tears steaming down your face, and most of all, you’ll find yourself praying for his rescue.